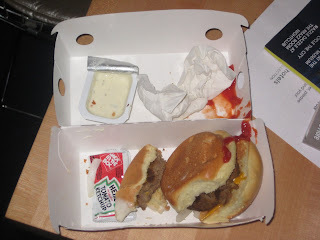 West Coast fast food chain, Jack In The Box makes a nice burger. On the last night of our Pacific Burger West Summer Eatcation, I got a case of the late night munchies. My wife had passed out in the hotel room and I was contemplating running out for a snack. That’s when I remembered there was a Jack In The Box next to our hotel. San Fran is known for being a very liberal city embracing all kinds of people and the ones in this Jack In The Box were the shadiest, strangest and drunkest ones of all! I had intended on a cheese burger and fries until I peeped the mini sirloin burgers on the menu. Mmmmmmmmmmmm, MMMMM, I do love me some sliders so why not? I grabbed my minis, curly fries and soda and high tailed it back up to my room. The curly fries and ranch dip were darn tootin and a reason to choose Jack In The Box over their competitors. 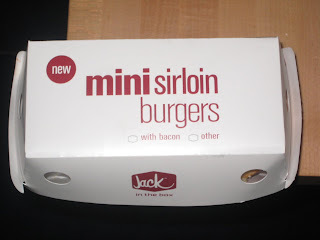 The minis though, I won’t lie, they were terrible. The buns were dry, the meat tasted like a room temperature sponge dipped in garden soil. The onions, which normally are the best part of a slider, were flavorless and gross. I couldn’t even finish them off. What a let down. Should’ve known better and just ordered a regular burger. Sliders are better off made from a greasy spoon that specializes in the delicacy. This entry was posted in Burgers, California, Fast Food, Hamburgers, San Francisco and tagged best burger, burger conquest, california, cheese, ciancio, david, fast food, french fries, hamburger, jack in the box, nyc, restaurant, rev, review, san francisco, sliders, summer eatcation. Bookmark the permalink.